Now that the 2018 election is over, and the “Blue Wave” has swept more Democrats into office than at any time since Watergate, the 2020 election is lining up at the starting gate. Democrats have much to be hopeful for considering the historically low approval ratings of Donald Trump (who has never managed to reach 50%) and the Senate map that has twice as many Republican Nationalists defending their seats as Democrats. This of course means that Fox News is already chomping at the bit to canonize Trump and malign Democrats. 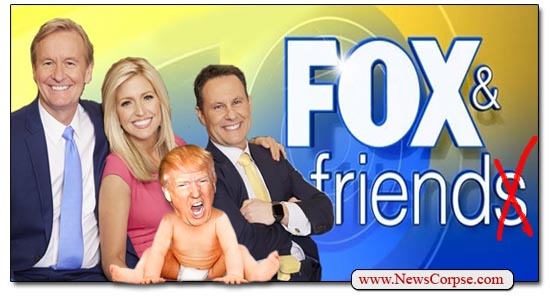 And nowhere more than Trump’s favorite Fox program, Fox and Friends, is the mudslinging perched at the ready to attack. On Sunday’s episode of the melodrama that Fox passes off as “news,” the “Curvy Couch” potatoes were on the edge of their sofa with excitement at the prospect of smearing those pesky liberals who won by a massive majority three weeks ago. They began by featuring a tweet thread by Sen. Brian Schatz (D-HI) wherein he rejected the notion that Democrats would engage in a fight between moderates and progressives. But then the Foxies ignored that and rattled off their own bitterly partisan narrative. Really? Campos-Duffy actually thinks that all of the Democrats who might run for president in 2020 are masked socialists? However, she and her Fox News comrades have known it all along. That’s actually an accurate representation of Fox’s long held bias that has earned them the State TV label that was recently affirmed by the discovery that Fox’s former president, Bill Shine, now works for Trump is being paid simultaneously by both. What’s more, notice how Campos-Duffy characterizes capitalism as “American,” but leaves off any such judgment of patriotism when she mentions socialism. That’s typical of Fox News and the right who routinely ignore the fact that many of the core principles of American society are rooted in socialism. That includes everything from public libraries and schools to Medicare and Social Security. Campos-Duffy went on to say that she hopes Democrats nominate a progressive, which she said “means socialist.” Co-host Griff Jenkins then chimed in to say that the 2018 election proved that there are no “blue dog” Democrats who are moderates or conservatives. And of course, Hegseth agreed saying that “You’re totally right. And there will be no more ‘code talk,'” by which he meant Democrats hiding their clandestine socialist conspiracy. But they are deliberately misleading their willfully ignorant audience. The Democratic Party is far more diverse in every way than the Republican Nationalists, and that includes political ideology. In fact, there are even many right-leaning Democrats who Fox News has been crowing about for their opposition to Nancy Pelosi as the next Speaker of the House. So they are contradicting their own narratives. Whoever the next Democratic nominee for president is, it will be someone who far surpasses the flagrantly idiotic, racist, narcissistic, criminal, treasonous, rage-aholic, fear fetishist who is occupying the White House now. And if it’s someone who recognizes the benefits of broad ideologies – including socialism – it will be the will of the people that got that person the nomination. And, hopefully, the White House. It’s called democracy. Get used to it Republicans, because your authoritarian, gerrymandering, voter suppressing ways are coming to an end. Well, the conservatives never have and never will treat the rest of America as equal citizens. Ya know, it’s simply an amazing thing…Refibs and Fox News willingly, but no less blindly, support a president that incessantly praises Putin, who was not only a socialist, but a ranking intelligence communist official of the USSR and then turn around and decry Dems as socialists.